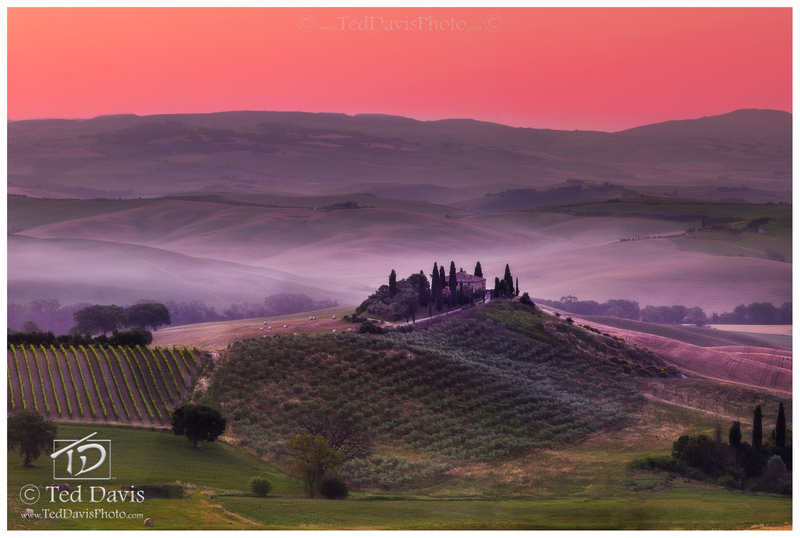 If the beauty of Tuscany could be captured in one shot, Belvedere would be that moment. As the first hint of dawn greeted the retreating night sky, fog began to coalesce around the hills, farms, and meadows of the Montalcino region. I was chasing the idyllic Tuscan morning and as time slipped closer to actual sunrise, a coral colored glow suffused the horizon. With rows of grape vines, groves of olive trees, and wheat fields spanning the landscape in front of me, I marveled at the timeless beauty. I was witnessing a scene that mankind has been cultivating for thousands of years, to a time before the written word! It was a truly remarkable experience as I snapped the perfect image. Photo © copyright by Ted Davis.